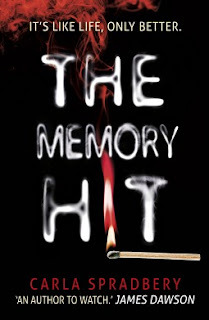 I really enjoyed The Memory Hit by Carla Spradbery. It was a tense, pacey read and I loved how the characters interacted and how all of the different story lines merged together. Admittedly, story lines involving drugs and memory aren't my favourite and I was hesitant to read this book, I am still really glad that I did. I loved the way this book managed to surprise me. Both in terms of twisty plot line but also how dark it went. The Memory Hit by Carla Spradbery is the story of two main characters, Jess and Cooper after both have pretty intense experiences on New Year's Eve. Jess ends up in a house fire after discovering her best friend and boyfriend have been cheating and that her boyfriend has been dealing drugs. And without having any time to adjust to that new scenario, her best friend is in hospital badly injured. Meanwhile, Cooper is attacked and ends up on the bad side of local drug dealer and is forced into coming up with way more money than would be possible with their family's limited income. I really liked Jess and Cooper as narrators. Occasionally the narration drifts off into other perspectives and I found these fairly short chapters from another point of view jarred me out of the story but at least they were infrequent and I felt like Jess and Cooper did well to invest me emotionally throughout. The fact that these two are exes made everything between them super intense and I loved that between them. But I also just really liked them as individuals. Jess is one of those strait-laced girls whose main focus is very much on good grades and this whole thing with her boyfriend and her best friend really sends her for a loop. She becomes very intent on finding out answers for all the questions raised by the texts she's seen on her boyfriend's phone and the things that Cooper has experienced. The whole idea of Nostalgex was intriguing. A drug that simulates past memories and helps clarify things and contort the memories into different ways. And Cooper was just lovely. Obviously a boy who has made plenty of mistakes but you can tell he's still a good guy. Especially by the way he treats his sister and how he shoulders the burden of keeping them both afloat after they fall on hard times. I feel like there is so much to talk about with The Memory Hit. I loved the family relationships and the complicated mess of being exes and ex-friends after a break-up and the twisted family histories that crop up, both with Cooper and Leon, the drug dealer. I loved Jag and Cooper's friendship in particular. I thought it was interesting to see one of the characters succumb to the temptation of Nostalgex. The person behind it all was an absolute surprise to me and there were a couple of really gruesome deaths that felt a bit shocking. I loved that darkness. I just really found this book to be really entertaining throughout!